THE SULTANABAD RUG - inventions of classical form and color, they fit beautifully in any room . The city of Sultanabad was from its inception a planned city, built by the Persian Qajar Dynasty to be a centralized rug-making capital of North West Iran. It arose in the footprints of ancient settlements, with new buildings erected directly over ruins. Construction took place primarily between the late 18th and early 19th centuries, and by the late 1800s, Sultanabad was producing some of the most commercially successful carpets on the international market. Today, Sultanabad is known as Arak, capital of Marzaki Province. It has evolved into a thriving industrial and commercial center, a home to over 500,000 people. Arak, in its relatively short history, has assumed a modern identity, a successful one, though with little connection to textile-making past. And so the original name, Sultanabad, is retained to denote an earlier time, as well as an earlier art: those exceptional 19th century Mahal carpets made during Sultanabad’s brief, but supremely influential, artistic flourishing. 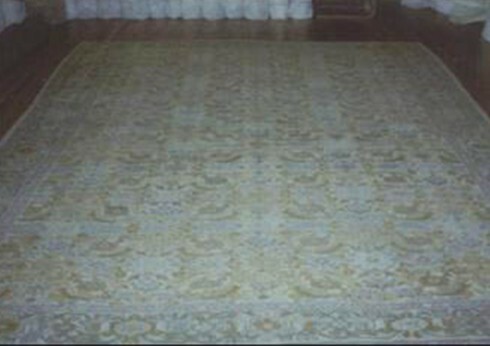 Sultanabad rugs are, at their core, Mahal rugs of North West Persia. But they are Mahal rugs transformed, most significantly by cultural cues from the west. Demand from the international market altered the centuries-old form in subtle ways. Original Heriz and Serabi designs, closest cousins to the Sultanabads, were transformed to fill newly room-sized fields, and to fill those fields more elaborately, more fully, with less geometric, more curvilinear all-over motifs. Floral patterns branch out widely in masterfully executed Sultanabad motifs; they grow spacious, less dense and more refined. Medallions are enlarged. Arabesques more sharply defined. The guiding aesthetic was the emerging Arts and Crafts Movement, which in the 19th century spread rapidly from its origins in the British Isles to Europe and North America. The movement emphasized simple, traditional, visibly exposed craftsmanship in the execution of large-scale, often romantic design. In response to the new Arts and Crafts aesthetic, Sultanabad weavers also softened the bold color palette typical of North West Persian rugs. Dark reds mellowed into deep roses; bold navies became variegated pastel blues. All subtle transformations considered, there is a strong argument to be made that Sultanabad carpets were the first Persian rugs designed explicitly for the Western market. 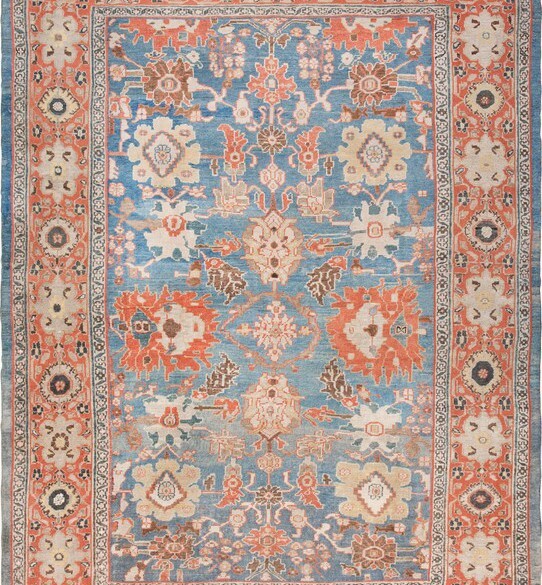 Of course, western demand had for centuries influenced production of Persian carpets—ever since the first textiles were traded to medieval Europe—but there is no indication that any rugs prior to the Sultanabad carpets of the 19th century had been explicitly made for dealers in New York, London, and Rome. Among the famous dealers of Sultanabad rugs, one stands out as central to the development and popularization of the form. This is the famous firm Ziegler & Co, an Anglo/Swiss-owned, Manchester-based firm. In the late 19th century, Ziegler actually established its own workshops in the city of Sultanabad, with the primary objective of producing high-end rugs woven to Western specifications. Ziegler & Co’s influence cannot be overstated, and today the firm's name is virtually synonymous with the Sultanabad form. The carpets are in extremely high demand today. Reinventions of classical form and color, they fit beautifully in any room where the old is combined with the new. Their warm color palette—defined by reds, golds, beiges and ivory earth tones—brings quiet life to minimalist space. Sultanabad rugs match harmoniously, and perhaps most overtly, with the late 19th and early 20th century arts and crafts furniture with which they share an aesthetic lineage; but then again, they are exceptionally versatile carpets, and can fit in just about any room.